A renowned style, delicate and at the same time bold, our Johnson Ten Drawer Dresser offers enough antique charm and authentic hardwood detail to make a statement on any bedroom decor. Derived from solid pieces of hand-chosen hardwood, this storage piece features the perfection of Amish hand-craftsmanship, combined with modern features that will add functionality to your morning routine. The main piece of the dresser features four half drawers that surround two large drawers, each one gracefully extending from the piece, revealing beautiful dovetailed drawer boxes and high-quality full-extension slides, giving you access to all of your items inside as they extend completely away from the frame. Below, four huge drawers are ready to house your wardrobe and everyday necessities for quick access. Again, each drawer offering the same brilliant, dovetailed construction, leading to generations of continued service. Above, the thick, solid top is ready for any decor. From the occasional bouquet of flowers, to your jewelry box, and photos of your loved ones, this dresser adds more to your space than just a way to store clothes. Add the optional wood famed mirror to complete the look as shown and ensure you have an easy way to take one final look as you head out to face the day ahead. 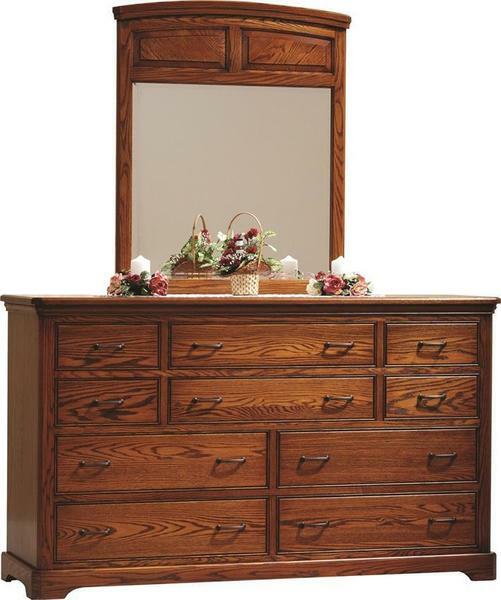 Customize this dresser by choosing from nine different hardwoods, each with their own unique characteristics, allowing versatility into any decor. Choose from an array of finish options to complete you new hardwood dresser and let us bench build the bedroom suite of your dreams. You can also choose your favorite hardware, or go with the pieces that are shown.